She is such a funny little thing, and she brings so much joy to our lives it's kind of ridiculous. I'm not one of those people who thinks of animals as being equal to a person (I know she's just a dog), but I do make plenty of fur baby jokes and she's very important to us. I work part time, but there's been times over the past couple of years when I didn't even do that, and having her here is so great. I don't think it's good to always be by yourself, and a pet is such a good companion to have around. Lemon is playful, snuggly, funny, and she gives me something to do and focus on. She follows me everywhere, and she has such a good personality. Having had several pets over the years, it always surprises me just how different animals' personalities can be. And they're so much smarter than we give them credit for sometimes. We used to have an aussie/heeler mix several years ago, and unfortunately he was not the breed of dog for us. I did a lot of things wrong with him, and he was just too much to handle. Dane could not stand him, and I ended up having to find him a new home. It took so much convincing for Dane to agree to get another one! I had been begging and begging for months, and Dane finally agreed to some of my terms (small, inside dog, non-shedding) and I thought I had a breed picked out and I was going to start saving my money. 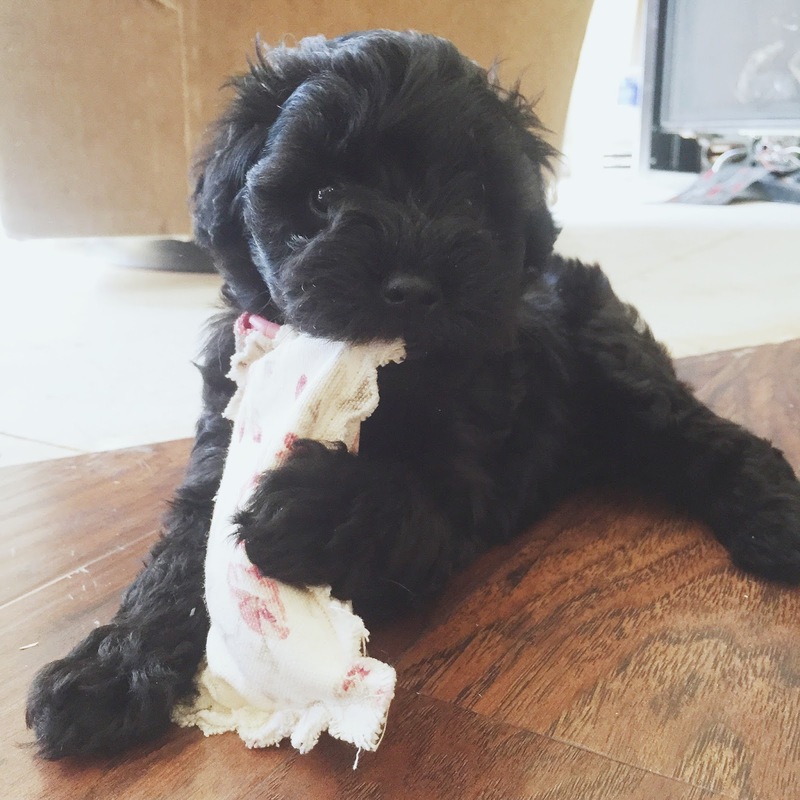 I originally wanted a Havanese puppy (look them up, they are the dang cutest!!) but they are super pricey, so I was perusing Craigslist on a regular basis in case something came up that was a good deal. Well, one afternoon, I got home from work and started browsing online. 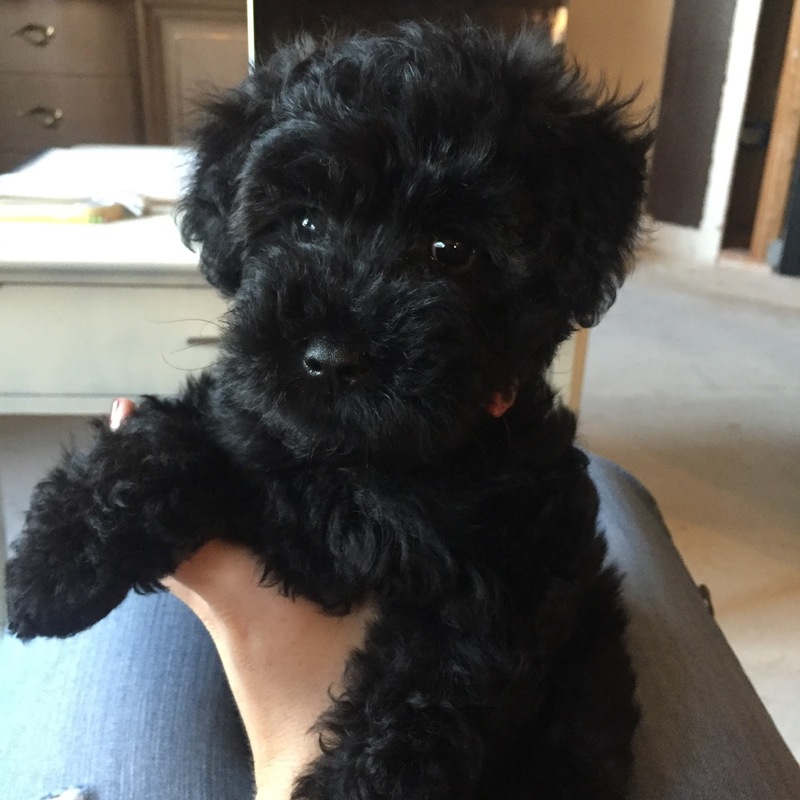 I saw an ad for some schnoodle puppies (mini schnauzer/poodle mix) that were as cute as all get out! 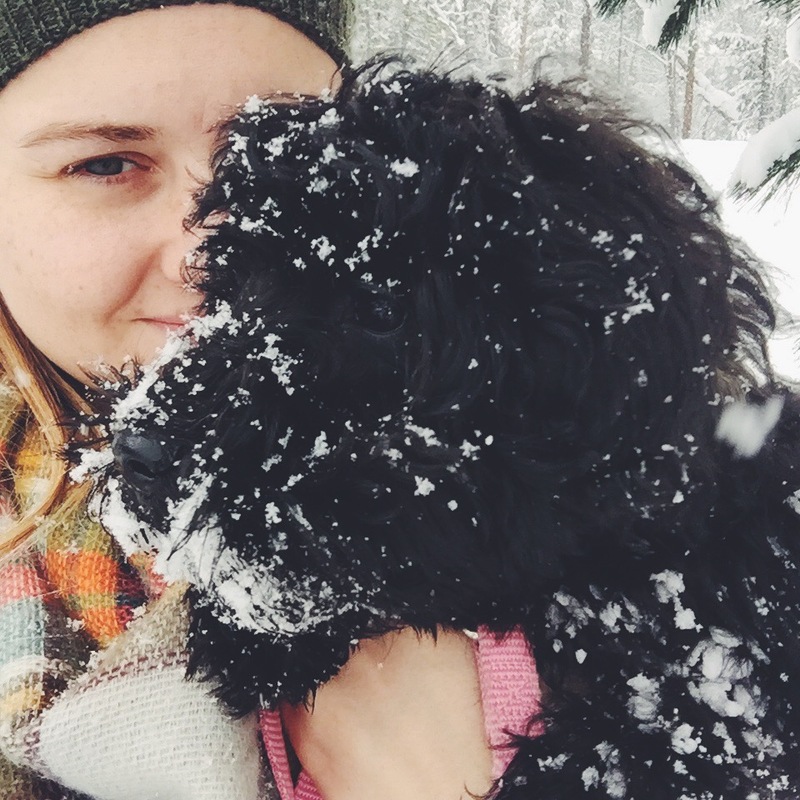 One of my favorite bloggers/card makers Amanda from Wit & Whistle has two adorable schnoodles, so I knew they were little teddy bear dogs. I did some research on the breed, and they make for such a good pet. Plus, when we were first married, we had a mini schnauzer that was stolen from us, so we knew we liked that breed. I called Dane and commenced to begging again, haha! It took some bargaining, but he agreed to let me go pick one out, and I was over the moon! I knew I wanted a girl, and they had a few sable colored girls, and one black. I thought I wanted a lighter colored dog, so I was looking at the lightest of the sables and I was planning on picking her out. Well, I got there and my plans changed very quickly! The family handed the one I picked to me but then the littlest of the litter, this tiny black thing, came waddling over. I picked her up and just melted! That was it for me. I said it within seconds, this was the one I wanted, and it was just too funny that Dane and I had already decided on the name Lemon after Liz Lemon from 30 Rock, haha! Not very fitting for a black dog, but that's what it was and I think it suits her just fine ;) Plus, I started calling her Lemon Bean almost immediately. So now she goes by Lemon, Lemon Bean, Bean, Bean-Bean, and occasionally Yemen or Melon, because apparently it's a hard word for toddlers. She has been my little shadow for the last two years, and even Dane couldn't help but admit that she was very cute when I got her home. Now he's gotten almost as attached to her as I am, and she loves him too. She practically throws him a ticker tape parade every day when he gets home from work, and she will lay on his lap and stare at him so adoringly, it makes us laugh so hard! 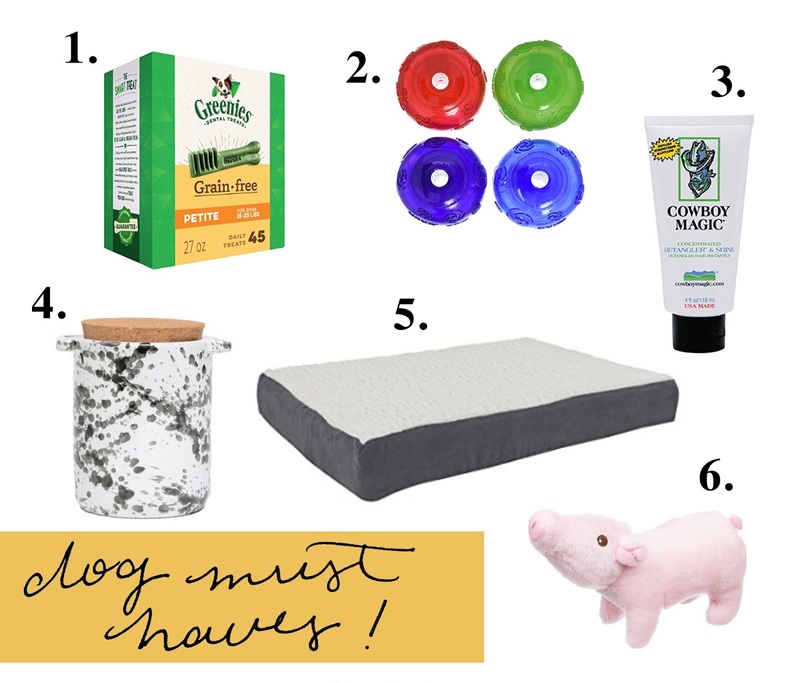 I also thought today that I'd share some of our favorite dog products, as well as some things I have on my wish list. These treats are hands-down Lemon's favorites. She goes absolutely nuts for them, and I love them because they clean her teeth. One downside of the poodle gene is that they have notoriously bad teeth as they get older, so one way I'm trying to prevent that is by giving her these. And I feel like too much wheat is bad for anyone, so I love that they come in a grain-free option! These little bouncy balls are durable, and they have a squeaker that isn't terribly easy to get to make sound, which means it's less annoying. Plus, it has a hole for putting treats and it makes a great puzzle toy she can work on for long periods of time. It usually hangs out in the car for her to have something to do while we're in town. This de-tangler might be the number one must have on the list, especially for poodle mixes, or any dog that has high maintenance hair. Since Lemon is a non-shedding breed, her hair has a tendency to get knots and mats pretty easily. Rubbing a little of this over her fur before I brush her makes it so much easier, and it even gets tough matting out! I just use a little extra on those spots and voila! Now we're onto my wish list items. While a treat jar is probably a must, this one is so cute that I may have to get it once we move into the new house. How adorable would it look on a shelf? Lemon has had a few different beds since we've gotten her, and I've been able to figure out what works with some trial and error. This bed has a removable cover that will make washing easier than her current bed. Plus, it's super affordable and available on Prime! So there you have it, my must haves and wants for my little Bean. Do any of you have a pet that is special to you? Let me know!